I’m at the moment in London for a photography trip and to film a series of lectures on black and white Fine Art photography for a well-known UK photography school where I will be teaching soon and I would like to meet as many London photographers as I can while I’m here. It would be a great occasion for those who are in the city to get to know each other and for all if us to shoot the city together. 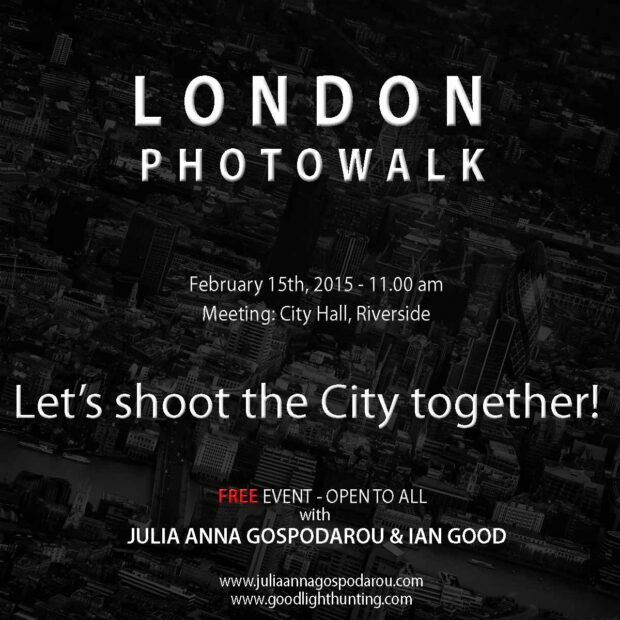 So, I decided to put up a small photowalk on Sunday February 15th and I will be leading it together with my friend and London based photographer Ian Good. Ian is a great photographer and knows the city perfectly and we will take you to a few of the most well-known locations in London. It will be a casual FREE event, no fee or registration needed, everyone is invited to join us, and we would be so happy to meet you all and shoot with you. We will move around the City of London and I will share with you tips on B&W, long exposure and architectural/urban photography. If you are in London on Sunday and want to join us, you are welcome. Even if you are not London based, you can still come. This is why the meeting is later, so we can wait for everyone to reach London. There are photographers even flying from abroad for this event and I can’t wait to meet everyone. No specific equipment is needed, you can shoot with a high-end camera as well as with your phone. If you can though, have your long exposure equipment with you, as we will try to shoot some long exposures if the weather is fit for this. Looking forward to meeting you on Sunday. Let’s shoot the city together!